Section X Championships - at St. Lawrence Univ. 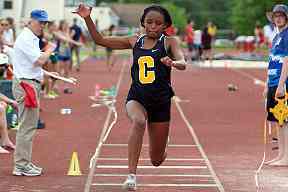 A Canton athlete high steps through the first try during the triple jump event. Malone’s Breanna Sprague ran first in the 100-meter dash. Hayley Raville won the shot put. Gouverneur’s Ciara Spicer captured the 200-meters. Grace Cummings won the steeplechase. The Wildcats won the 1600-meter relay. Potsdam’s Luca Pecora ran for gold in both the 400 and the 400 hurdles. Grace Merchant topped the high-jump competition. Yvonshae Stevens won the long jump. Sophia Janouan produced the best mark in the triple jump. The Sandstoners won the 400-meter relay. 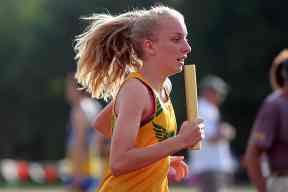 Canton’s Grace Bessette won both the 800 and 1500 meter runs. Teammate Arianna Whitaker won the 3000 meters. Canton bested the 3200-meter relay. Massena’s Hayley Castagnier won the 100-meter hurdles. Norwood-Norfolk’s Alaina Elliott tossed the farthest discuss. Tupper Lake’s Sophia Martin won the girls pentathlon.